Aside from the music and dancing and drinking, and in addition to the retelling of certain stories saved for this once-a-year event, much of the celebratory spirit that convulsed the entire Island and its provinces downstate was focused on Saturday afternoon’s downtown events: the tug o' war, the cart race, and an event watched closely by a dozen hungry dogs, the infamous fish toss. Amazingly the tug o' war, for which no one counted the tuggers on each side (thus permitting an imbalance), was essentially a dead heat with a disputed victory entered in the ledger for the country cousins, the hay-seeders. As for the cart race, which involved multiple-person skis, tire jumps, rosy ring-arounds, and, yes, a cart race, well, that sure was a nice cart Rich Gillespie created just for this event. 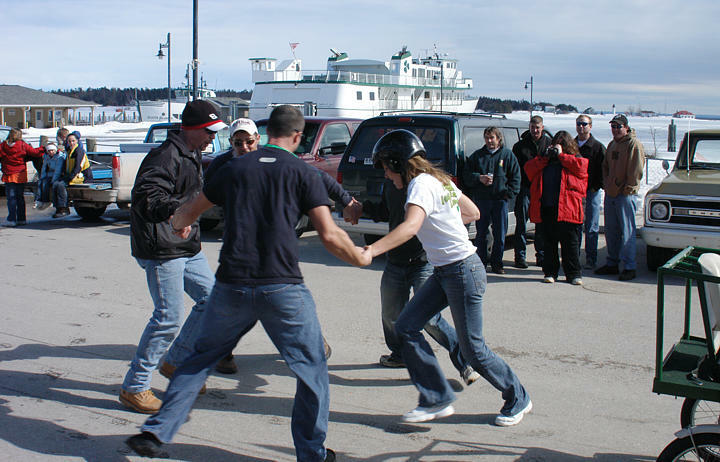 But the fish toss produced several serious charges of chicanery the next morning, accusations ranging from excessive fish-greasing to a flat-out accusation that the winner, the Charlevoix Courrier's Jeremy McBain, had unfairly used the diversion of a sweet lullaby played moments before the toss on his treasured bagpipes to lull his competitors into a dispiriting languor–a charge seemingly proved when the staunch lad removed plugs from his own ears before gripping the fish, which his jealous detractors said had only been worn to prevent him from succumbing to his own siren's spell.